. Mai A, Massa S, Pezzi R, Simeoni S, Rotili D, Nebbioso A, Scognamiglio A, Altucci L, Loidl P, Brosch G. Class II (IIa)-selective histone deacetylase inhibitors. 1. Synthesis and biological evaluation of novel (aryloxopropenyl)pyrrolyl hydroxyamides. J Med Chem. 2005 May 5;48(9):3344-53.
. Nebbioso A, Dell'Aversana C, Bugge A, Sarno R, Valente S, Rotili D, Manzo F, Teti D, Mandrup S, Ciana P, Maggi A, Mai A, Gronemeyer H, Altucci L. HDACs class II-selective inhibition alters nuclear receptor-dependent differentiation. J Mol Endocrinol. 2010 Oct;45(4):219-28. 1. 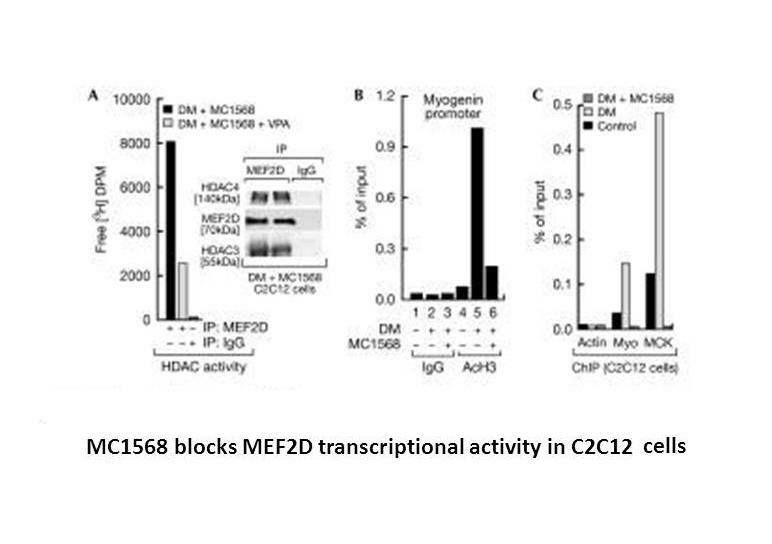 Class II-specific histone deacetylase inhibitors MC1568 and MC1575 suppress IL-8 expression in human melanoma cells. Pigment Cell Melanoma Res. 2013 Mar;26(2):193-204. doi: 10.1111/pcmr.12049. Epub 2013 Jan 7. 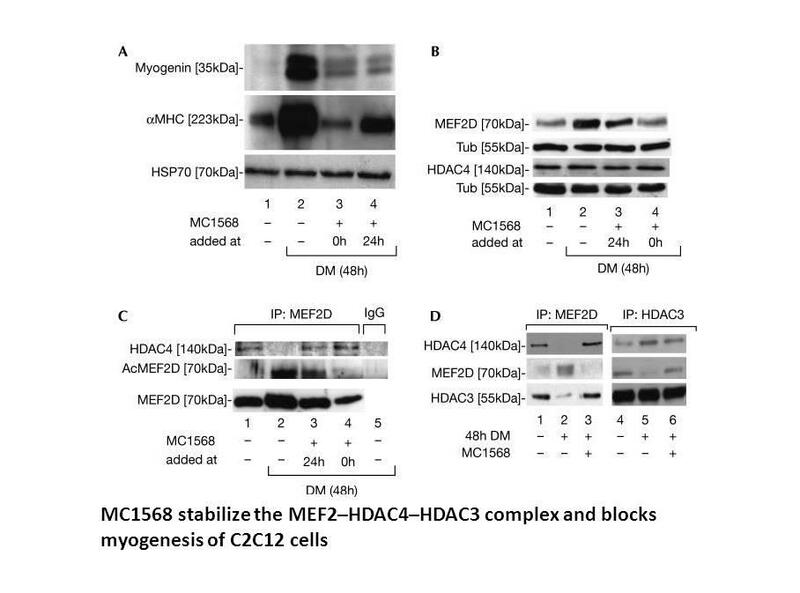 MC1568, an HDACi, inhibited IL-8 levels and cell proliferation in unstimulated or PMA-stimulated GR-M and OCM-3 melanoma cell lines through suppressing c-Jun binding to the IL-8 promoter, recruitment of histones 3&4, Rna polymerase II and TFIIB to the IL-8 promoter and c-Jun expression. 2. 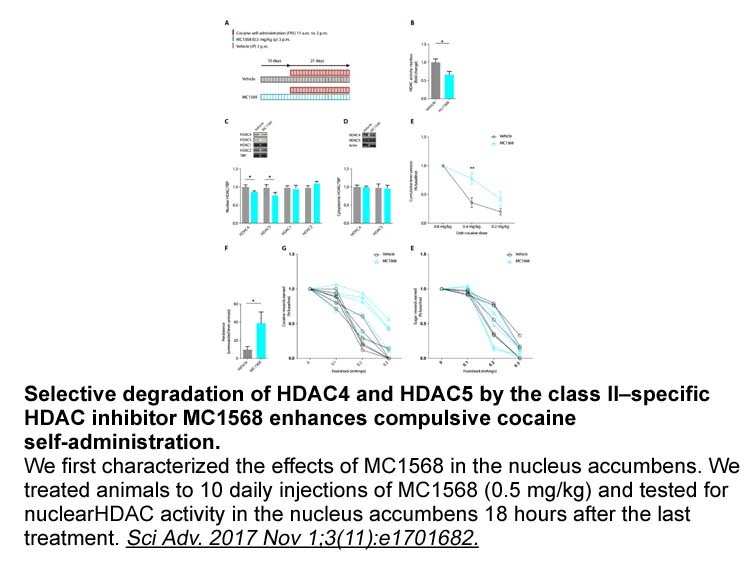 Improved Synthesis and Structural Reassignment of MC1568: A Class IIa Selective HDAC Inhibitor. J Med Chem. 2014 Feb 13;57(3):1132-5. doi: 10.1021/jm401945k. Epub 2014 Jan 30. 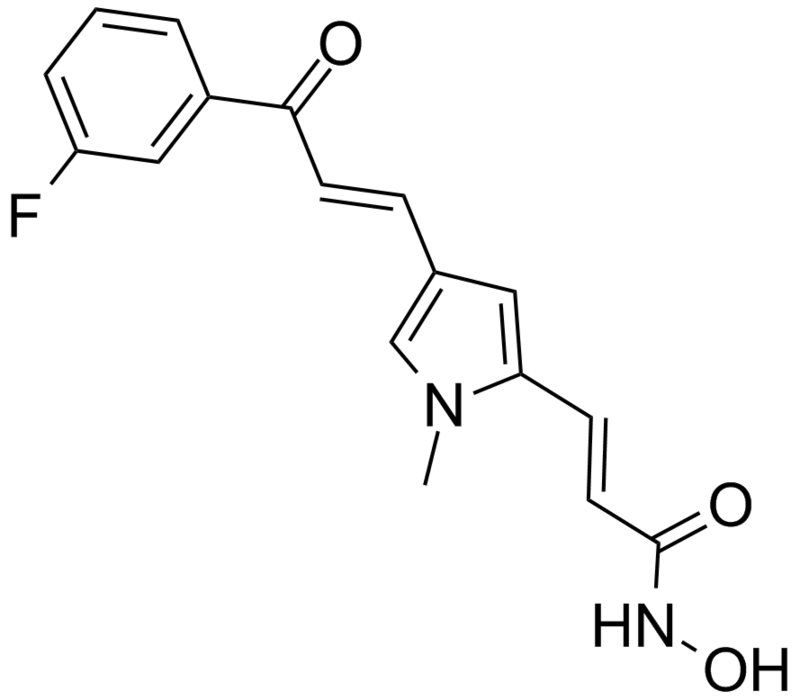 MC1568, an inhibitor of class IIa HDAC has been described in terms of synthesis and structural reassignment. Mai A, Massa S, Pezzi R, Simeoni S, Rotili D, Nebbioso A, Scognamiglio A, Altucci L, Loidl P, Brosch G. Class II (IIa)-selective histone deacetylase inhibitors. 1. 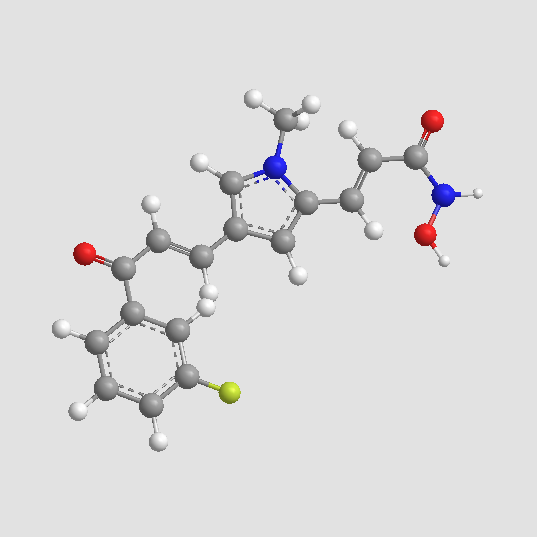 Synthesis and biological evaluation of novel (aryloxopropenyl)pyrrolyl hydroxyamides. J Med Chem. 2005 May 5;48(9):3344-53. 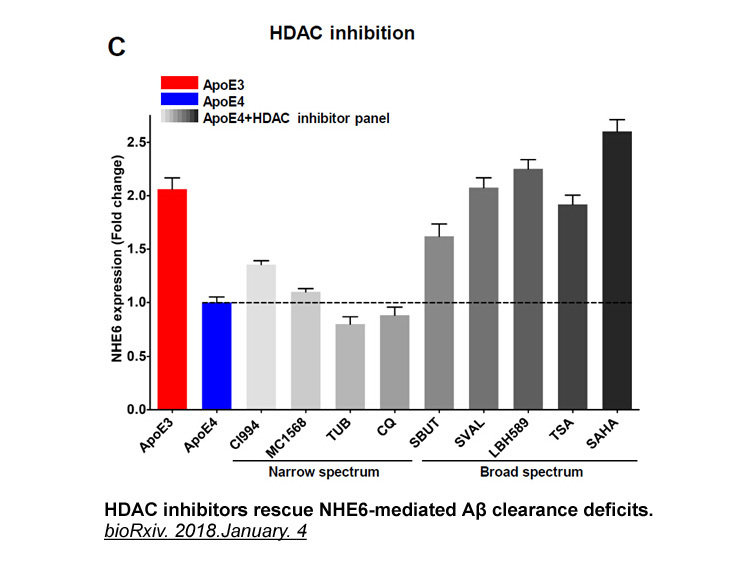 Nebbioso A, Dell'Aversana C, Bugge A, Sarno R, Valente S, Rotili D, Manzo F, Teti D, Mandrup S, Ciana P, Maggi A, Mai A, Gronemeyer H, Altucci L. HDACs class II-selective inhibition alters nuclear receptor-dependent differentiation. J Mol Endocrinol. 2010 Oct;45(4):219-28. doi: 10.1677/JME-10-0043. Epub 2010 Jul 16. Nebbioso A, Manzo F, Miceli M, Conte M, Manente L, Baldi A, De Luca A, Rotili D, Valente S, Mai A, Usiello A, Gronemeyer H, Altucci L. Selective class II HDAC inhibitors impair myogenesis by modulating the stability and activity of HDAC-MEF2 complexes. EMBO Rep. 2009 Jul;10(7):776-82. doi: 10.1038/embor.2009.88. Epub 2009 Jun 5.